Leaves of Polyscias fruticosa, photographed by Forest & Kim Starr. Polyscias is a genus of about 100 species of trees and shrubs found in the tropics of the Old World. Some species of the genus are grown for culinary use, with the young leaves used as a pot herb. 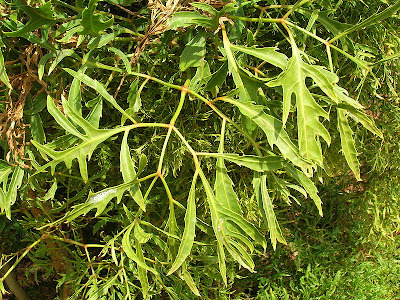 These include the Ming aralia P. fruticosa, also grown as an ornamental plant. Characters (from Philipson 1995): Unarmed, glabrous or furfuraceous. Leaves imparipinnate or 2-3-pinnate (rarely unifoliate) with elongated or short sheathing base. Inflorescence terminal often large, flowers arranged in umbellules, capitula or inflorescence racemose; pedicel articulated below ovary. Calyx a rim with undulate or dentate margin. Petals four or five. Ovary 4- or 5- (-8 or more) locular; styles either free or recurved (at least in fruit) or joined to form beak-like stylopodium; exocarp fleshy; endocarp chartaceous; seeds with endosperm surface uneven, fissured or rarely smooth.